From the moment it was announced, Ant-Man was viewed as a bit of a risky move by Marvel. Even for a comic book movie, a guy that gets really small and talks to ants seemed like a bit of a stretch. Could they make it work? Would this be the beginning of the end for Marvel? Of course not. Marvel doesn’t seem capable of making a genuinely terrible movie, and Ant-Man was far, far away from terrible. Following up on epic adventures like Guardians of the Galaxy and Avengers: Age of Ultron, Marvel gives us a small, fun, and funny heist movie that more than delivers. The short version: 9/10, definite watch, and do so in 3-D if possible. One of my favorite MCU movies yet, largely because it’s something different from what we’ve gotten so far. For more details, keep reading. 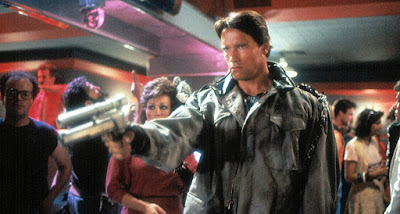 The film that put James Cameron on the map, The Terminator is quite rightly seen as a science fiction classic, a film that has had enormous impact on modern pop culture thanks to both the lasting impression that The Terminator made and the huge career boost that James Cameron received afterwards. Without The Terminator, I very much doubt that we would have seen the rest of James Cameron’s filmography come to fruition, never mind the number of actors that he has since helped turn into film stars. The story follows Kyle Reese as he travels back in time from a post-apocalyptic future in which an artificial intelligence known as Skynet has taken over the world. His mission is to protect Sarah Connor from a killing machine known as a Terminator that was also sent back in time to kill her thanks to the fact that she is destined to give birth to the leader of the human resistance. The time travel mechanic is a creative and tidy way to set the story in motion, and allows James Cameron to hint at the much larger world he has created without it getting in the way of the progression of the story and the momentum that is being built from the very start. It also allows Cameron to easily explain why Kyle can’t call for back up, and why the police and authorities are simply unable to help – it’s a very smart way of ensuring that their is no easy way out for the main characters, keeping them isolated and on the run for the entire movie. Which is important, because at it’s core The Terminator is little more than a slasher flick with a science fiction flair. The Terminator itself is the ultimate slasher bad guy, a silent, expressionless, intimidating and virtually unstoppable killing machine that is never too far behind our heroes, who are hopelessly outmatched. The best example of this is during the now iconic assault on the police station – even dozens of cops on their home turf can’t do anything to stop the Terminator, really upping the ante and making the Terminator feel as dangerous and unstoppable as it is meant to be, while at the same time showing us how capable Kyle Reese must be to have successfully fought the Terminator off several times before now. Potentially more important, The Terminator manages to avoid the casual misogyny and conservative politics that are now synonymous with the slasher genre, defining itself as markedly different during a time when slasher flicks saturated the market – no doubt a part of why The Terminator was both a critical and commercial success in it’s time and why it still stands up as a solid piece of film making over 30 years after it’s initial release. It’s also worth pointing out how well developed the relationship between Kyle Reese and Sarah Connor is in The Terminator when compared to Terminator Genisys, and it’s mostly because of the subtle but important character work that the The Terminator does with Sarah Connor both before and after her first encounter with Kyle Reese. You can understand completely why a vulnerable and scared Sarah Connor would seek comfort in the only man in the world that knows what she is going through, but the equivalent of this in Terminator Genisys is (like everything else in the film) rushed, forced and ultimately unsatisfying. And the only reason that this all works as intended is because of Cameron’s ability to recognise and work within his limits. His original idea for The Terminator also included a liquid metal robot that would go on to be the primary antagonist in Terminator 2: Judgment Day, but he cut it because he knew that the visual effects available in 1984 weren’t good enough to do the idea justice. This restraint is noticeable throughout The Terminator, which saves it’s limited special effects for important moments and manages to do more with it’s modest budget (just $6 million!) than films that cost upwards of 20 times as much – I’m looking at you, Terminator Genisys. I still stand by my opinion that The Terminator should never have been a franchise, with the phrase “diminishing returns” very much applicable to the series after Terminator 2: Judgment Day, but that’s neither here nor there – The Terminator is a testament to the importance of inexperienced directors being given the opportunity to prove themselves, showing us the potential longevity of a film when an idea is executed well by someone who knows what they are doing. Even if The Terminator has since been overshadowed by it’s own sequel, it’s still an important and entertaining film that shouldn’t go under appreciated.